A cataract is the clouding of the eye’s naturally clear lens. The lens is part of the eye that helps focus light on the retina. The retina is a light sensitive layer of tissue lining the inner surface of the eye. The optics of the eye create an image of the visual world on the retina through the cornea and lens. The clouding caused by a cataract reduces the sharpness of images reflected in the retina resulting in blurred vision. 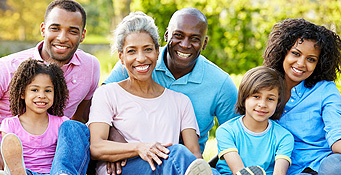 Most cataracts are related to aging, usually starting at age 40. Cataracts are so common that by age 80 more than half of all Americans either have a cataract or have already had cataract surgery. How is my vision affected by cataracts? 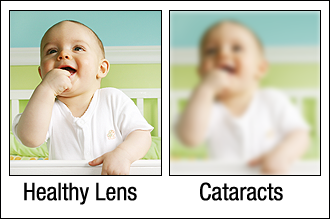 A cataract is caused by one of two changes in the lens: clumping of protein or discoloration. The lens is primarily composed of water and protein. In the case of a cataract the protein clumps up in areas clouding the lens and reducing the amount of light that reaches the retina. This can start with small clumps and increase in size to completely cover the lens requiring cataract surgery. In the case of discoloration the lens slowing changes to a yellow and/or brownish color. Over time this brown tint to the lens becomes more prominent making it difficult to read and identify colors such as blues, purples and blacks. Gradual discoloration of lenses does not affect the sharpness of the image. The natural wear and tear on eyes due to job requirements, lifestyle and environment are possible factors causing cataracts. Cataract Surgery is the most effective treatment for cataracts. The procedure requires removing the lens of your eye and replacing it with an intraocular lens (IOL). The surgeon makes a small incision on or around the cornea, removes the cloudy lens then inserts the new IOL into place. Due to advancement in technology, a new type of cataract surgery called phacoemulsification does not require needs or stitches. With this technique clear vision is restored almost immediately and the eye heals rapidly.